Tembo the Badass Elephant is a strange game, even on paper. A game produced by Sega, makers of Sonic the Hedgehog, but developed by Game Freak, Inc. the Pokémon people. Something about that combination sounds intriguing, even if Game Freak, Inc. has little to no experience outside of the franchise that’s made them successful. 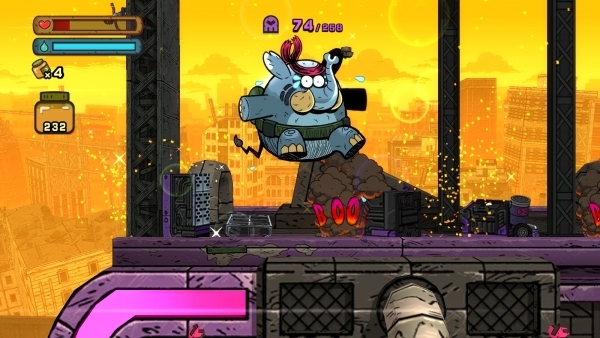 In Tembo the Badass Elephant you play as Tembo, an elephant who is called upon in times of war to defeat evil, collect peanuts and awkwardly solve platforming puzzles. There’s a lot to like in this game, even if it doesn’t all feel great. Any connection to a Sonic game will evoke a certain style of gameplay. One in which the player runs, quickly, from left to right while jumping on enemies and collecting some sort of currency, in this case the currency is peanuts. Tembo is a fast moving elephant, he can barrel down the levels with blazing speed, slamming into almost anything in his path. The controls for Tembo are simple and that does a lot to focus the action on the elephant and his platforming and hell raising. One button causes Tembo to dash, another makes him jump and another sprays water to help extinguish fires and solve puzzles. Tembo rushes around levels saving hostages and destroying the evil army in front of him. It’s at this point where Tembo offers its greatest strength and its greatest weakness. While Tembo does a great job of emulating the speed of a Sonic game, it’s level design feels crippling to the elephant at times. Puzzles that seem simple became frustrating as I tried to simply jump from one platform to another. This was because when Tembo lands he stops charging, forcing you to re-press the charge button and jump while a platform crumbles beneath you. Or, in other platform puzzles, Tembo’s strange aerial controls caused me to barrel downwards to my death. Tembo can dive-bomb enemies while in the air by pressing the charge button or simply pressing down. But too often I found Tembo flying downwards as I tried to move him left or right, causing him to fling himself into an early grave. This silly problem wouldn’t have been such a big deal if the levels weren’t hard on their own without the platforming issues. I felt as though I was struggling to control Tembo and not because he moves so quickly but because he moves awkwardly and the levels just don’t feel designed for him. When I wasn’t prematurely killing the elephant hero, I was enjoying the game’s other mechanics. When not trying to solve a jumping puzzle, Tembo barrels into enemies but timing is key. Enemies often have lasers, swords or bombs that hurt Tembo so waiting for the right time to strike is important. These brief battles forced me to stop and be strategic with my maneuvers rather than throwing myself into every encounter. The short boss battles in Tembo, whether the mini boss battles in-level or the actual main boss battles, are also a lot of fun. I actually found the bosses to be a great summation of all the skills you’ve learned up until that point. While Tembo never learns new abilities, the game is smart about teaching you how to use the limited abilities you have in different ways. While the second boss definitely felt like a strange increase in difficulty, I never felt that I was being cheated and that I always had the tools I needed to win. In fact, I’d rank the final boss battle as one of my favorites just in terms of technicality as it had me using mechanics I’d learned in mini-boss battles and stages from the first level to the last. Speaking of difficulty, Tembo is meant to be a difficult game. As the stages progress they become harder and require more precise timing. Making it all the more frustrating when Tembo doesn’t do what you want him to. 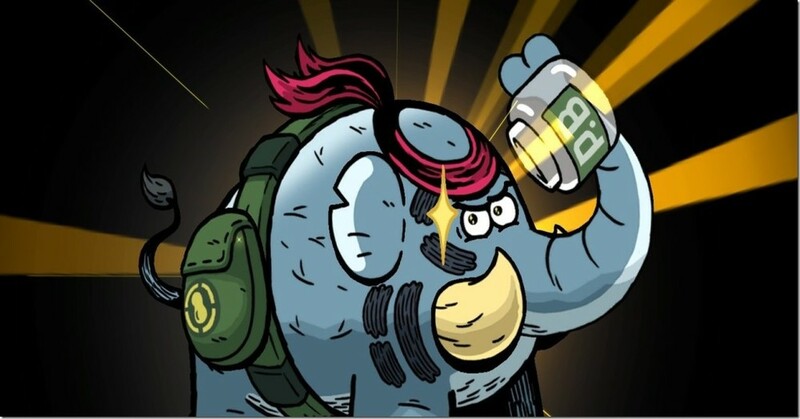 Peanut butter is live in Tembo and when you lose all your health Tembo eats a jar of the creamy goodness to keep fighting. Running out of peanut butter starts you back up with 5 jars and off you go to fight the evil army. In fact, Tembo is a great looking game and its art style doesn’t do it justice in screenshots. When in motion, the game has a bright and vibrant life to it and it’s the first thing you notice as it pops off the screen. Colorful explosions and a rampaging elephant bring a lot of pleasing aesthetics to the forefront and Tembo does a great job of mixing a wartime look with bright and varied colors. Despite my displeasure at playing the same few levels over and over, the varied locations and eye-catching art did a lot to keep me engaged. I found myself going back and forth with how I felt about Tembo the Badass Elephant. From its awful title and frustrating puzzles to the great sense of speed and mayhem, I felt like everything great was brought down a peg or two by unnecessary frustration and locked levels. Why does it matter how many points I have, just let me move on and fight the boss. If you can get past the issues that Tembo has and the strange level locking, there is a lot to enjoy with this elephant Rambo wannabe. While it may not be the best platformer of our time, it’s a decent enough romp for the $15 price tag. As with all games based on momentum and constantly pushing forward, stopping is death. And when the game comes to that same full halt, guess what dies then.